I have a few more of these character collages left, so here are a couple new ones. 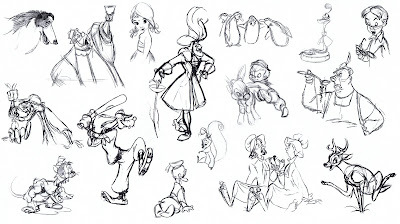 Most of the drawings are by Milt Kahl, but not all. Captain Hook is of course by Frank Thomas. I like this drawing so much, years ago I turned it into a wire sculpture and gave it to Frank for his birthday. He also drew the Gouchito and the donkey. That little short has some of Frank's best animation. The stepsisters are by Ollie, and the debate goes on, whether they were handled too broadly next to the stepmother and Cinderella. The drawing sure looks beautiful, though. 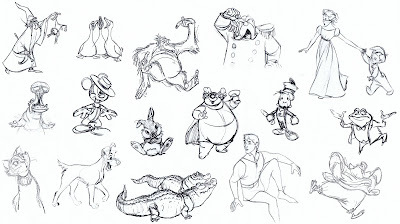 That's a John Sibley Goofy, he did some of the best stuff with that character. Norm Ferguson drew this Gideon, a rich pantomime character. 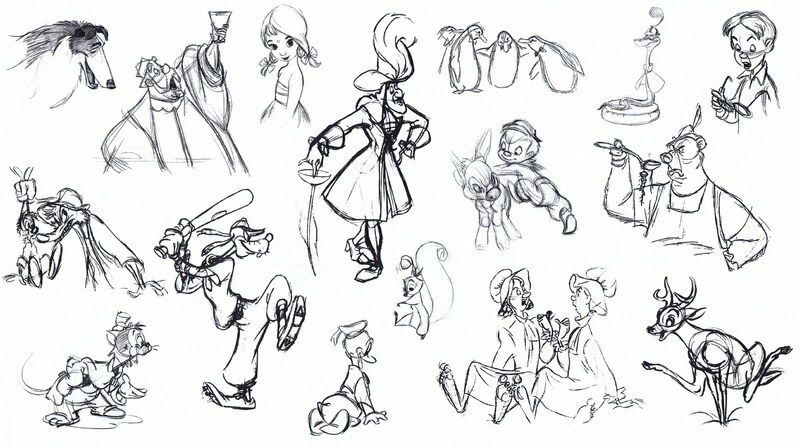 I believe this Donald, who is part of a model sheet, is by Milt Neil. It almost looks like a Kahl drawing. 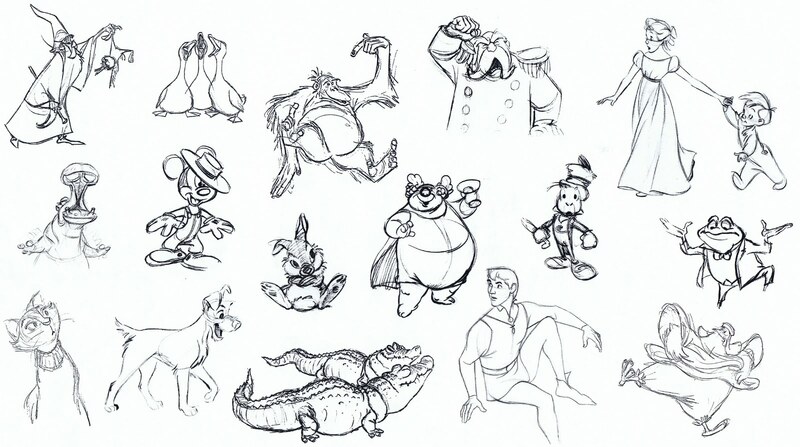 Highlights on the second sheet are the Preston Blair hippo, the Fred Moore Mickey and the Kimball Jiminy Cricket. Prince Phillip is from an experimental scene, the design looks a little different. I will have a separate post on this model change later. You can see in the drawing of the king from "Cinderella" how Milt started to push his straight lines in order to simplify and solidify his designs. That's even more evident in the stunning key drawing of Merlin holding Archimedes. The contrast in shapes is so much fun. His thin feet and then the huge, baggy sleeves. All these would make beautiful wall paper!